Straight VS Angled Spotting Scopes - Which is The Best? →Straight VS Angled Spotting Scopes – Which is The Best? 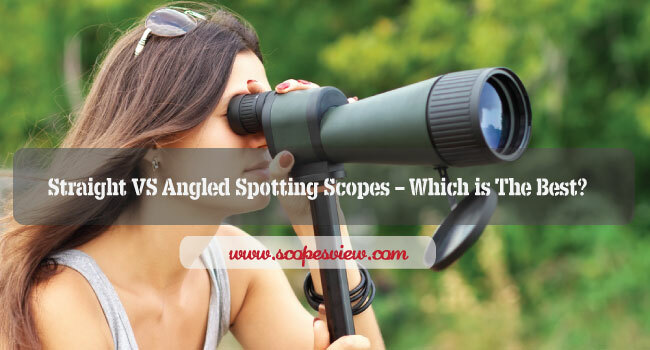 Home » Straight VS Angled Spotting Scopes – Which is The Best? Straight VS Angled Spotting Scopes – Which is The Best? If your question is about Straight VS Angled Spotting Scopes & which is the best? Then you are the right place, we are here to let you know. Spotting scopes are probably the most misunderstood in the marketplace of scope optics. This is mostly because many hunters do not really understand how to utilize a spotting scope to its fullest extent or they never really gave it a try. This might leave you confused. Which type of spotting scope should you buy? What kind of coating are you exactly looking for? And is there something known as digiscoping? We won’t tell you which spotting scope is the best, but will discuss the different aspects such as features and designs of both types of scopes to enable you to make a decision which spotting scope is the best choice for hunting. Angled vs straight spotting scope is an ongoing debate, and it depends on your preference which one you should go for. And, the most important factor is to consider the features before investing in a spotting scope. So let’s learn everything about these spotting scopes. Straight spotting scopes come with an eyepiece and have the body on the same horizontal optical plane. There are times when the eyepiece of the spotting scope is also on the same horizontal level just like the body. Porro prism spotting scopes is one of the major example. However, it will always maintain the horizontal optical design. How to know if straight spotting scope is best for you? No matter what kind of skills professional hunters have, they all can use a straight spotting scope. They’re extremely convenient user-friendly option for beginners because they can do the task much more easily. When Should You Use a Straight Spotting Scope? There are a couple of places where straight spotting scope is actually quite beneficial, specifically target shooting and hunting. They are very comfortable if you go for hunting regularly and/or shoot from blinds or ridge-lines, car mounts etc. It is also useful for observing the nature or sea life. Create a straight path your target from you. You can see your target in exact direction where the scope is. You can also mount it quite high above the ground which can help in avoiding any mirage effects. You have to raise the tripod to your eye-level, which can create problems in tripod stability. Uncomfortable to reach high angles. It’s very difficult to share. Angled spotting scopes are a type of scopes which come an eyepiece located at an angle of 45-degrees to its body. Is Angled Spotting Scope right for you? Angled spotters are very tough to use and one of the reasons is that the line of sight is always on a slant angle which makes it difficult to detect the moving targets. Professional hunters with some prior experience in spotting scopes can use it in a better way. When Should You Use an Angled Spotting Scope? You can use it for birding, hunting, astronomy, and a lot of other things. They are extremely versatile for general use. It is a lot Easier view on higher angles. You can rotate it on different angles which will make viewing easier on a car mount. Straight spotting scopes work great on the target range and this is also a great option while you’re on hunting, and even more so when it’s difficult to look what is beneath you and it is needed the most. They are also very convenient and user friendly. Angled spotting scopes are an excellent option for people who’re into birding because you can easily look higher. However, it can be difficult to find and track your target. You need some time to master it. If you are confused between both of them, you can always go for Swarovski ATX/STX spotting scopes. Go for the objective module, a model which goes well with both straight and angled eyepiece. While you’re going for birding, choose the angled one, and if you would like to focus on the skills at the range, get back to the straight one. Needless to mention, it is the costliest option and it’ll cost you a quite a lot of money. Finally, you need to decide on the body style of your spotting scope and figure out the design features to know how to use the spotting scope. Are you going to use it for ranging and hunting? A straight scope is a great choice. Is birding your major activity? If yes, you should go for an angled scope. Would you like to use a camera with the scope? Go for the one which is digiscope adaptable. Both the options have their advantages and disadvantages, and so it depends on how you want to use it. Another important point to consider, though, is whether you are going to share the view with others. When you are using a straight spotting scope, you need to adjust the elevation of the tripod before sharing the image with anyone. With an angled spotting scope, this is not important. The eyepiece rotates, so one can easily use the scope without adjusting the tripod. Keep all these great tips about Straight VS Angled Spotting Scopes in your mind to make the best choice.